hat would be more relaxing and refreshing than a nice shower after a long hectic day of work and stress? However, not just any bathroom would do. You need a nicely decorated bathroom fitted with the best showerhead delivering great water flow. Metal and plastic showerheads are among the most beautiful bathroom fittings besides high level of durability. Of course, you would expect high-end showerhead to be expensive. Is it possible to find an affordable showerhead featuring the same quality and elegance of their expensive designer counterparts? After thorough research and comparison of the showerhead brands currently present in the market, we have realized a few interesting facts that could help you find the best yet affordable fitting for your bathroom. In this post, we will give you in-depth review and comparison of the top 3 cheap shower heads in the market. Showerheads can be made of either metal or plastic. Both of these materials look great and are highly durable. They are also resistant to the damaging effects of pressurized or heated water. Hydroluxe Full-Chrome and Ana Bath SS5450CBN are both made of plastic ABS (Acrylonitrile butadiene styrene). This type of plastic is resistant to impact, is tough and heat resistant. It is also among the most affordable materials for the construction a wide range of products. Moen 3669EP Handheld Shower features a metal shower head. It is made of stainless steel that not only looks great but also very durable. Such steel is resistant to damage by water, heat or rust formation. Stainless steel is also very tough. These features make metal shower heads a little bit costlier than their plastic counterparts. A water head must have a hose that conduits water from source to the spray heads. The hose can be made of different materials just like showerheads. 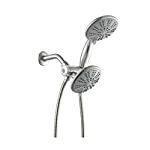 However, most showerhead manufactures like to use the same material used to make the showerhead for the hose. Hydroluxe Full-Chrome features a 5″ super-flexible stainless steel hose with conical-brass hose nuts to allow for easy tightening by hand. Ana Bath SS5450CBN is fitted with flexible 60 inches long stainless steel shower hose with anti-twist brass conical and brass hex nut. Moen 3669EP Handheld Shower, Chrome on the other hand features a 69-inch long flexible hose made of plastic although it looks like metal finished. One stressful thing is to purchase a product that you would want installed in your house only to bring it home and learn that you do not have the necessary equipment and tools to carry out the installation. This is why it is important to choose showerheads that can be installed without tools. Hydroluxe Full-Chrome requires no tools to install. It is accompanied with a user manual. All you need to do is just follow the steps presented in the manual and your shower will be operating in no time. Ana Bath Combo Shower System also offers one of the easiest ways to install your shower system without any tools. Every component can be installed by hand meaning no need for power drills or screwdrivers. Just like its counterpart from Hydroluxe, all you need is to go through the user manual provided and your elegant shower will start serving you. Moen 3669EP Handheld Shower on the other hand does not come with everything needed for the installation. You will need to buy a Drop Ell (A725) to connect to the water supply. You will also need to pair it with a mixing valve and trim (to adjust temp, volume, on and off, etc) and a diverter/transfer trim and valve. Although these components can be seen on the image on Amazon, the product delivered does not include them. 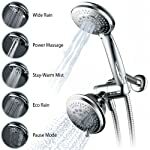 This is perhaps where you will find the biggest differences between these top three cheap showerheads reviewed and compared here. 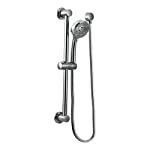 Hydroluxe features five Full-Setting High power Shower Head as well as Hand Shower. The settings include Wide Rain, Water-saving Economy Rain, Power Massage, Stay-Warm Mist, and Pause Mode. Other features include Oversize 4″ Chrome Face, three-zone Click Lever Dial, Rub-clean Jets, Patented 3-way Water Diverter featuring Anti-Swivel Lock Nut as well as Angle-adjustable Overhead Bracket. Ana Bath Combo Shower System has great features including water saving shower technology allowing you to save your water bill. The package comes with 5-function 5″ handheld shower with massage spray, saturating spray, saturating spray, bubbling spray and massage spray, saturating spray & bubbling spray. Flow rate is 2.31 GPM or gallons per minute) or 8.73 LPM (literd per minute). The water pressure of 80 psi meets CSA Standard. Moen 3669 Eco-Performance feature faucets designed to balance your water pressure perfectly. It offers four–function 4-inch diameter spray head designed to conserve water without sacrificing performance. These functions include meets full spray, invigorating spray, and targeted massage. Its slide bar makes it easy to adjust the hand held shower height and meets EPA WaterSense. Although the Hydroluxe and Ana Bath models each have five types of functions, Moen could be the best alternative for low water showerhead. Among most important reasons for choosing a particular brand of a showerhead is to enhance the appearance of a bathroom. As previously, mentioned, greatly designed showerheads offers the best when it comes to cosmetic enhancement of a bathroom. Besides the material used, the color also matters. It is important to choose a showerhead with a color that matches the interior décor of your bathroom. These accessories come in different colors and it is upon you to choose the color that suits your needs. The most commonly used colors in bathrooms are chrome, nickel and silver. The showerhead from Hydroluxe is chrome colored making it appear cool, elegant and professionals. It gives the bathroom a warm, refreshing touch. The model from Moen is also chrome colored. Another great color is the one featured by the Ana Bath SS5450CBN. The brushed-nickel finish is especially elegant and luxurious. Weight is also a very important factor. Since these designs have handheld components, it is vital that they are lightweight. Luckily, designers know this fact and the most important brands feature lightweight models. These showerheads are all lightweight. The Hydroluxe weighs a paltry 1.8 pounds and measures 7 x 5 x 9.5 inches. The Ana Bath SS5450CBN weighs 2.5 pounds and measures 7.8 x 6.3 x 13.1 inches. The Moen 3669EP weighs a little bit more at 3.5 pounds and measures 33 x 5.9 x 3.2 inches. Hydroluxe Full-Chrome has 2 functions in 1. It features a shower head and a handheld shower combo offering flexibility amidst options. Ana Bath too has a shower head and a handheld shower. Moen on the other hand is just a single handheld unit but offers high level of flexibility because of its long hose. Although it is usually true that high quality stuff are more expensive than the regular brands in the market. With adequate research, it is possible to find some of the best quality showerheads at very affordable prices. Our analysis reveals that the brands reviewed here are some of the cheapest models currently in the market. However, how does the price compare with quality and performance? Has a 2-in-1 function this makes it the best choice for if you suffer on and off back problems. You can aim the one stream at the back and the other at the head. 5 full setting high power head and 5-setting hand shower allows for more refreshing and invigorating bath. Made of thermoplastic making it extremely lightweight but highly affordable. Very easy to install- does not require any tools. It is a great product for the cost of about $24 because of the Plastic construction, 2-in-1 function, and tool less installation. 5 types of functions provides luxury and more satisfying showering experience. Has a 2-in-1 function suitable for persons with on and off back problems. Requires no tools to install and installation is quick. Made of durable, elegant and affordable thermoplastic. Very high quality yet very affordable. It is made of high quality stainless steel for durability, toughness and elegance. It’s a low water showerhead meaning it can be used more widely. Four function combination spray offers more variety. Easy to install if you have all the necessary components. It is a high-pressure showerhead meaning you need high water pressure in your residential area. You can go around these by removing flow resistor in both heads. Like the Hydroluxe model, it is a high pressure shower but removing the flow control piece can solve the matter. It does not come with everything you need for the installation but the components are readily available for the local hardware stores. Hydroluxe Full-Chrome: Choose this if you have high pressure water supply and you need a great shower head at the lowest price. Ana Bath SS5450CBN: Choose this if you looking for a medium priced shower head with more features and you have high pressure water supply. Moen 3669EP Handheld Shower : Pick this higher priced model if you need more luxurious bathroom because of its better construction materials and additional features.